CDSC members at UW April 2018. From left: From left to right the people in the picture are: Julia, Charlie, Nate, Aaron, Salt, Sneha, Emilia, Sayamindu (the top bit), Kaylea, Jeremy, Mako. Photo (CC BY-SA) by Sage Ross. 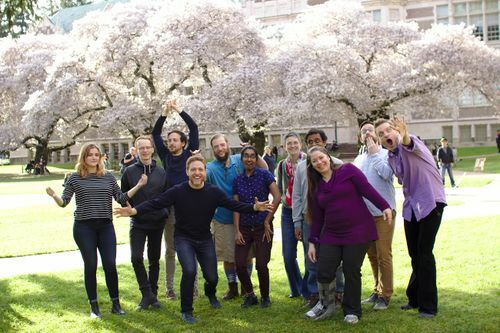 The Community Data Science Collective is an interdisciplinary research group made of up of faculty and students at the University of Washington Department of Communication and the Northwestern University Department of Communication Studies. We are social scientists applying a range of quantitative and qualitative methods to the study of online communities. We seek to understand both how and why some attempts at collaborative production — like Wikipedia and Linux — build large volunteer communities and high quality work products. Our research is particularly focused on how the design of communication and information technologies shape fundamental social outcomes with broad theoretical and practical implications — like an individual’s decision to join a community, contribute to a public good, or a group’s ability to make decisions democratically. Our research is deeply interdisciplinary, most frequently consists of “big data” quantitative analyses, and lies at the intersection of communication, sociology, and human-computer interaction. In addition to research, we run workshops and teach classes. Some of that work is coordinated on this wiki. 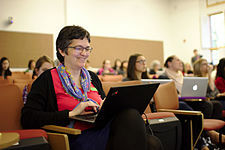 A more detailed lists of workshops and teaching material on this wikis is on our Workshops and Classes page. In this page, we only list ongoing classes and workshops. 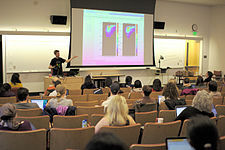 Community Data Science Workshops — The Community Data Science Workshops (CDSW) are a series of workshops designed to introduce some of the basic tools of programming and analysis of data from online communities to absolute beginners. The CDSW have been held roughly twice a year since beginning in Seattle in 2014. 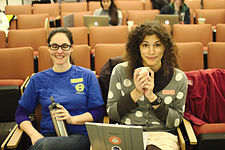 So far, more than 100 people have volunteered their weekends to teach more than 500 people to program in Python, to build datasets from Web APIs, and to ask and answer questions using these data. 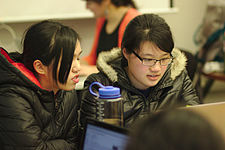 [Spring 2019] COMMLD520B: Community Data Science: Programming and Data Science for Social Media — A quarter long course taught by Tommy Guy that adapts and builds upon the CDSW curriculum to teach introductory programming and data science to absolute beginners in the context of the University of Washington's Communication Leadership program. [Winter 2019] COM482: Interpersonal Media: Online Communities — A course on online communities and computer mediated communication with an emphasis on learning from research in social psychology, sociology, and behavioral economics. taught by Nate TeBlunthuis. [Spring 2019] MTS 525: Statistics and Statistical Programming — A quarter-long quantitative methods course that builds a first-quarter introduction to quantitative methodology and that focuses on both the more mathematical elements of statistics as well as the nuts-and-bolts of statistical programming in the GNU R programming language. Taught by Aaron Shaw. If you are a member of the collective, perhaps you're looking for CommunityData:Resources which includes details on email, TeX templates, documentation on our computing resources, etc. Follow us as @comdatasci on Twitter and subscribe to the Community Data Science Collective blog. Continue reading "Exceedingly Reproducible Research: A Proposal"
Continue reading "Benjamin Mako Hill is a Research Symbiont!" Continue reading "Awards and citations at computing conferences"
Continue reading "Apply to join the Community Data Science Collective!" This is open to the public and hackable by all but mostly contains information that will be useful to collective members, their collaborators, people enrolled in their projects, or people interested in building off of their work. If you're interested in making a change or creating content here, generally feel empowered to Be Bold. If things don't fit, somebody who watches this wiki will be in touch. There's a CAPTCHA enabled. If you create an account and then contact any collective member with the username (on or off wiki), they can turn the CAPTCHA off for you. This page was last edited on 1 April 2019, at 07:48.